Every year, EPA awards grants to outstanding teams through the P3 (People, Prosperity, and the Planet) student design competition for sustainability. The students who participate tackle a wide range of issues, but each project aims to develop sustainable solutions to the world’s most pressing environmental and human health topics. The competition is a two-phase process. In Phase I, teams submit their design proposals for a chance to receive grants of up to $15,000 to research and test their original projects. In addition to gaining research funds, this year’s winning teams travel to Washington, D.C. to display their designs and prototypes at the National Sustainable Design Expo, which is held at the USA Science and Engineering Festival (USASEF). 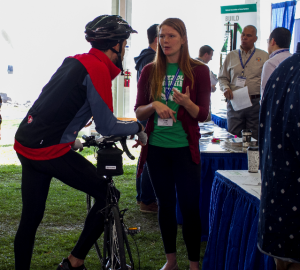 During the expo, teams showcase their work and designs while competing for a Phase II grant—which includes up to $75,000 in additional grant money to help further their projects and implement them in the field or marketplace. A student competitor from a previous year’s Expo explains her project to an attendee. Water testing and filtration is a popular topic this year. Multiple teams are working to remove contaminants from water through environmentally sustainable technologies, provide low-cost and innovative water purification methods for disadvantaged communities and ease poverty and hunger through sustainable aquaponics systems. Some teams are developing wearable sensors that collect air quality data, while others are finding ways to update inefficient technologies with solar power. Many teams are creating new ways to build upon existing green technologies, like harvesting wasted heat energy from LED lights, designing an air filtration device that reduces energy use and increases indoor air quality, improving the heat efficiency of solar panels, constructing a model of an automated hydroponic green roof, retrofitting energy conservation measures in rented residential buildings and producing design support tools for wildfire damage. Finding ways to recycle waste products for use as low-cost fuels or in green infrastructure is also an increasingly significant research effort that P3 students are investigating. Teams are creating biofuels and sustainable products from materials like sweet sorghum bagasse, algae blooms, dairy manure, linseed oil and mining waste by-product. One team is even developing plans for a community food waste collection kiosk that collects and stores waste for energy production within the community. We love our P3 competition because it provides wonderful opportunities for EPA and students alike. EPA has the opportunity to experience the innovation and creativity of aspiring scientists and engineers around the nation, and students get a chance to bring their innovative ideas to fruition. We are thrilled about the upcoming projects and cannot wait to see them at the USASEF National Sustainable Design Expo. For more info, see the press release announcing the winners and watch the video below. About the Author: Christina Burchette is a student contractor and writer for the science communication team in EPA’s Office of Research and Development.